"Iraq is once again at a crisis point. 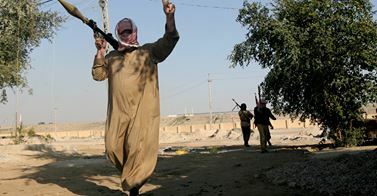 Given the sacrifices the United States, coalition partners and so many Iraqis made to bring the country back from the precipice of 2006, it is more than unsettling to see a third battle of Fallujah unfolding. But rather than point fingers and assign fault for this foreseeable threat, the focus needs to be on how to best move forward." Read more at The Washington Post. "Ahmed Ali, an Iraq researcher at the Washington-based Institute for the Study of War, cautioned that a military assault on Fallujah would likely lead to civilian casualties and "possibly invoke other violent tribal responses." It could also give al-Qaeda a chance to launch attacks in other parts of the country given the concentration of forces in Anbar. "It is important to recognize that (al-Qaeda) cannot be decisively defeated in Anbar. The (Iraqi military) presence in Anbar is therefore likely to be long-term, which increases the opportunities for (al-Qaeda) to exert control elsewhere in Iraq," he wrote." Read more at AP for TIME Magazine. "This is not just Iraq's war. AQI is now operating on three fronts, in Iraq, Syria, and Lebanon. The moderate Sunnis are the answer in each of these places, and the United States should be shaping policies to back them. Otherwise we leave them to observe our negotiations with Iran, our failure to hold Assad accountable for chemical attacks, and our provision of aid to Maliki. And we leave them to wonder if we simply don't care about their fate or are actually hostile to them." Read more at The Weekly Standard. For media inquiries, contact Maggie Obriwin at press@understandingwar.org or 202-293-5550 x205. The Institute for the Study of War (ISW) is a non-partisan, non-profit, public policy research organization. ISW advances an informed understanding of military affairs through reliable research, trusted analysis, and innovative education. We are committed to improving the nation's ability to execute military operations and respond to emerging threats in order to achieve U.S. strategic objectives. Visit us at www.understandingwar.org.